GALE CRATER, Mars (NASA PR) — A storm of tiny dust particles has engulfed much of Mars over the last two weeks and prompted NASA’s Opportunity rover to suspend science operations. 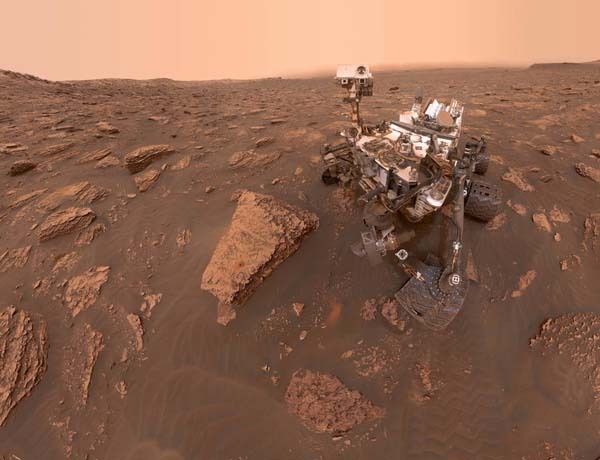 But across the planet, NASA’s Curiosity rover, which has been studying Martian soil at Gale Crater, is expected to remain largely unaffected by the dust. While Opportunity is powered by sunlight, which is blotted out by dust at its current location, Curiosity has a nuclear-powered battery that runs day and night. The Martian dust storm has grown in size and is now officially a “planet-encircling” (or “global”) dust event. Though Curiosity is on the other side of Mars from Opportunity, dust has steadily increased over it, more than doubling over the weekend. The atmospheric haze blocking sunlight, called “tau,” is now above 8.0 at Gale Crater — the highest tau the mission has ever recorded. Tau was last measured near 11 over Opportunity, thick enough that accurate measurements are no longer possible for Mars’ oldest active rover. For NASA’s human scientists watching from the ground, Curiosity offers an unprecedented window to answer some questions. One of the biggest: Why do some Martian dust storms last for months and grow massive, while others stay small and last only a week? “We don’t have any good idea,” said Scott D. Guzewich, an atmospheric scientist at NASA’s Goddard Space Flight Center in Greenbelt, Maryland, leading Curiosity’s dust storm investigation. Curiosity, he points out, plus a fleet of spacecraft in the orbit of Mars, will allow scientists for the first time to collect a wealth of dust information both from the surface and from space. The last storm of global magnitude that enveloped Mars was in 2007, five years before Curiosity landed there. In the animation above, Curiosity is facing the crater rim, about 18.6 miles (30 kilometers) away from where it stands inside the crater. Daily photos captured by its Mast Camera, or Mastcam, show the sky getting hazier. This sun-obstructing wall of haze is about six to eight times thicker than normal for this time of season. Curiosity’s engineers at NASA’s Jet Propulsion Laboratory in Pasadena, California, have studied the potential for the growing dust storm to affect the rover’s instruments, and say it poses little risk. The largest impact is to the rover’s cameras, which require extra exposure time due to the low lighting. The rover already routinely points its Mastcam down at the ground after each use to reduce the amount of dust blowing at its optics. JPL leads the Mars Science Laboratory/Curiosity mission. Martian dust storms are common, especially during southern hemisphere spring and summer, when the planet is closest to the Sun. As the atmosphere warms, winds generated by larger contrasts in surface temperature at different locations mobilize dust particles the size of individual talcum powder grains. Carbon dioxide frozen on the winter polar cap evaporates, thickening the atmosphere and increasing the surface pressure. This enhances the process by helping suspend the dust particles in the air. In some cases, the dust clouds reach up to 40 miles (60 kilometers) or more in elevation. Though they are common, Martian dust storms typically stay contained to a local area. By contrast, the current storm, if it were happening on Earth, is bigger than North America and Russia combined, said Guzewich. The dust storm may seem exotic to some Earthlings, but it’s not unique to Mars. Earth has dust storms, too, in desert regions such as North Africa, the Middle East and the southwest United States. But conditions here prevent them from spreading globally, said Ralph A. Kahn, a Goddard senior research scientist who studies the atmospheres of Earth and Mars. These include the structure of our thicker atmosphere and stronger gravity that helps settle dust. Earth also has vegetation cover on land that binds the soil with its roots and helps block the wind and rain that wash the particles out of the atmosphere. And that, boys and girls, is why you always bring a nuke.